ON the face of it not a lot seemed to have changed on the Queen Elizabeth since we last sailed on her seven years ago…and vowed never to do so again after the ship’s truly unforgettable inaugural voyage to the Caribbean. Roy Walker, star of the “Comedians” and “Catchphrase,” was still the biggest name performing in the Royal Court Theatre at night, a retired law enforcement officer was giving witty lectures during the day and there was still karaoke of very dubious quality in the Golden Lion pub. The entertainment on that Caribbean cruise had to been seen and heard to be believed. One of the highlights was a gentleman playing tunes on a vacuum cleaner. It’s true. Another was the comedian who started a stampede for the exits when he announced he was going to do a medley of Engelbert Humperdinck songs after half an hour of insulting the audience. The biggest laugh of his show was one of the stampeders sneaking back into the theatre to collect his wife’s forgotten handbag. 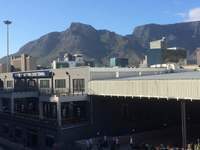 What changed our mind to give the Queen Elizabeth another go was, quite simply, Cape Town. The first major stopping point, where we disembarked, is one of our favourite cities … and this was almost certainly the last time we will go there. We’re getting too old for 17 hours of flights … Cape Town to Dubai (nine hours) and Dubai to Manchester, eight hours. But, we discovered, to be scrupulously fair, quite a lot had changed for the better on the Queen Elizabeth after the much-heralded £ multi-million refit. We were late bookers so we had a very limited choice of balcony cabins ... just one with an uninterrupted view on Deck Four. The accommodation itself was OK, even though the metal-fronted balcony itself did rather resemble grubby old paint-strewn 1930s tanker or the local tip on windy day. Might be worth spending a few bob more, Mr Cunard. And the pleasant young steward had to be reminded gently and occasionally that we were the guests. There were only three stops … Vigo in Northern Spain (sunny, breezy and busy), Funchal in Madeira (warm, sunny and welcoming) and Walvis Bay, Namibia, where such a mullock was made of the disembarkation procedure for the day that many people elected to stay on board. Even the dear old Garden Lounge seemed to have changed its image to reading marathons, occasional live music and quizzes. Whatever happened to those superbly-named seminars? We can still imagine the late, great Tommy Cooper saying: “A friend of mine said ‘You want to go to the Garden Lounge today. They’re having a seminar on puffy legs. So I did. And I got ‘em!’ The Lido now seems to stretch the length of the ship and is quite the best we have seen on 20-plus cruises for quality, quantity and variety. But, perhaps the biggest change was the quality of the entertainment and the musicianship. It was unfortunate that the two girl singers with the Royal Court Theatre Group had severe colds and some shows were cancelled. The huge band split up to play various venues around the ship but got together for one memorable evening in the Queen’s Theatre. And a spin-off group played a couple of excellent evenings of Dixieland Jazz in the Golden Lion. Plus another fair lady ... Captain Inger Thorhauge. And, oh yes, Roy Walker, aged 78, was just as funny as ever. ON the face of it not a lot seemed to have changed on the Queen Elizabeth since we last sailed on her seven years ago…and vowed never to do so again after the ship’s truly unforgettable inaugural voyage to the Caribbean. Roy Walker, star of the “Comedians” and “Catchphrase,” was still the biggest name performing in the Royal Court Theatre at night, a retired law enforcement officer was giving witty lectures during the day and there was still karaoke of very dubious quality in the Golden Lion pub. 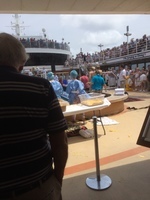 The entertainment on that Caribbean cruise had to been seen and heard to be believed. One of the highlights was a gentleman playing tunes on a vacuum cleaner. It’s true. Another was the comedian who started a stampede for the exits when he announced he was going to do a medley of Engelbert Humperdinck songs after half an hour of insulting the audience. The biggest laugh of his show was one of the stampeders sneaking back into the theatre to collect his wife’s forgotten handbag. What changed our mind to give the Queen Elizabeth another go was, quite simply, Cape Town. The first major stopping point, where we disembarked, is one of our favourite cities … and this was almost certainly the last time we will go there. We’re getting too old for 17 hours of flights … Cape Town to Dubai (nine hours) and Dubai to Manchester, eight hours. But, we discovered, to be scrupulously fair, quite a lot had changed for the better on the Queen Elizabeth after the much-heralded £ multi-million refit. We were late bookers so we had a very limited choice of balcony cabins ... just one with an uninterrupted view on Deck Four. The accommodation itself was OK, even though the metal-fronted balcony itself did rather resemble grubby old paint-strewn 1930s tanker or the local tip on windy day. Might be worth spending a few bob more, Mr Cunard. And the pleasant young steward had to be reminded gently and occasionally that we were the guests. There were only three stops … Vigo in Northern Spain (sunny, breezy and busy), Funchal in Madeira (warm, sunny and welcoming) and Walvis Bay, Namibia, where such a mullock was made of the disembarkation procedure for the day that many people elected to stay on board. Even the dear old Garden Lounge seemed to have changed its image to reading marathons, occasional live music and quizzes. Whatever happened to those superbly-named seminars? 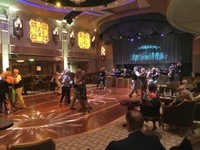 The Lido now seems to stretch the length of the ship and is quite the best we have seen on 20-plus cruises for quality, quantity and variety. But, perhaps the biggest change was the quality of the entertainment and the musicianship. It was unfortunate that the two girl singers with the Royal Court Theatre Group had severe colds and some shows were cancelled. The huge band split up to play various venues around the ship but got together for one memorable evening in the Queen’s Theatre. And a spin-off group played a couple of excellent evenings of Dixieland Jazz in the Golden Lion. Plus another fair lady ... Captain Inger Thorhauge. And, oh yes, Roy Walker, aged 78, was just as funny as ever.